The Belfast Giants booked their place at the PredictorBet Playoff Finals in emphatic fashion at the Skydome Arena in Coventry. A 7-2 victory over a hapless Coventry Blaze sealed a 12-2 aggregate success in a game that at times seemed more like a testimonial than a Playoff quarter final. 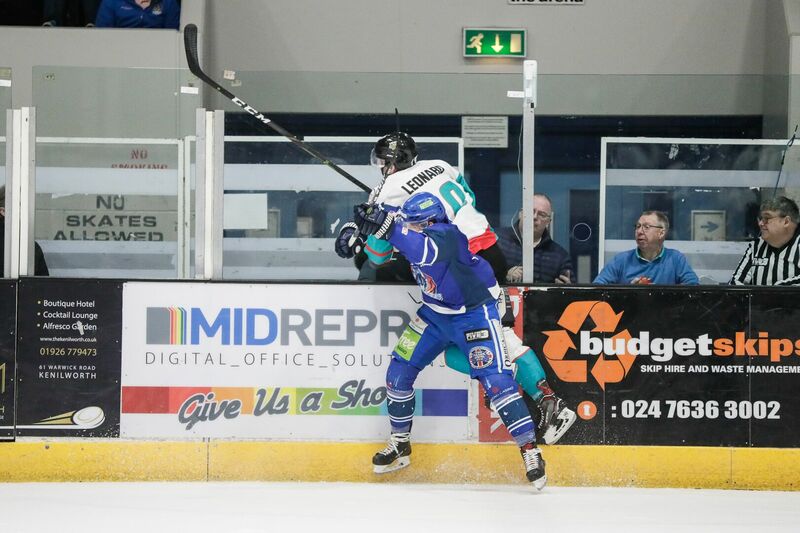 The pace was due to the inability of the Blaze to regain intensity in the tie once the scoreline grew to a point that it was practically out of reach for Danny Stewart’s side. Despite getting the early shots on Tyler Beskrowany’s net, the Blaze, already 5-0 down from the first leg in Belfast, found it difficult in the first period to break down the Giants as they reached out to a 3-0 lead on the night, 8-0 in the tie, through goals by the “Three Js”, Jonathan, Jim and Jordan. Ferland’s goal opened scoring at 10:43 before the goal of the night by Jim Vandermeer at 12:59. A strike which was proceeded by a remarkably worked move front to back where the Giants bamboozled the Blaze with sublime passing and movement to leave the Giants veteran D-man in the open for a rocket of a slapshot by Jordan Headley in the Blaze net. Headley, a surprise start for the game, has been back up to Matt Hackett the last number of months in Coventry and has shown great ability, not least when the Blaze took a win in the Viola Arena over the Cardiff Devils earlier this season. But his place in net was a welcome one for the Giants fans, despite the entertainment given the previous night in the SSE Arena when the effervescent Hackett lost his cool as the scoreline began to rise. Jordan Smotherman finished the scoring in the first period, increasing the almighty mountain the Blaze had to climb and leaving the Coventry faithful with 40 minutes remaining in their season. Dustin Johner made it 4-0 (9-0 agg) early in the 2nd period before the Coventry Blaze fans finally had something to cheer. Shawn Pauly finally getting the Blaze on the board after 86 minutes of play across the two legs. The enigmatic Ben Lake was to make it 2 for the Blaze as the Giants took a back seat for the middle of the game. Lake has been a stand out player in Sky Blue, it will be interesting to see if he remains in Coventry next season. 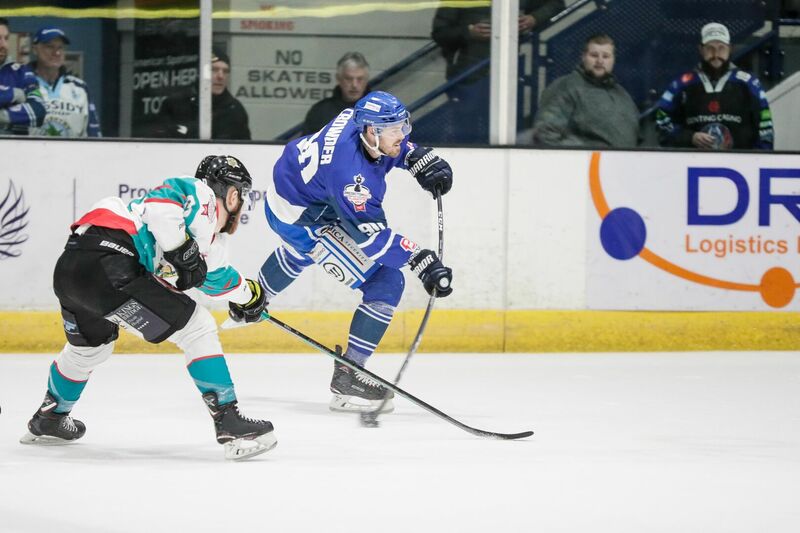 The Giants scored again early in the 3rd, Smotherman with his second of the game as the Giants started to play around with the Blaze and the pace of the game dipped, the home side accepting of their fate at 10-2. Smotherman was to get the hat-trick with 2 minutes to go, before a final goal from Blair Riley, brought the celebration of the night as the captain raced to the bench and waved at the patrons in Block 13 of the Skydome. Famous for their goading of the away benches, Riley giving them a little bit back in good humour that was taken very well by the Blaze fans looking on. A cathartic end to their season with 30s remaining. A 12-2 victory for Adam Keefe’s men meant that they will face off at 1pm next Saturday afternoon against the Guildford Flames, recovering from a 3-0 deficit at home to Glasgow to win 7-3 overall, in the Semi Final of the Predictorbet Playoffs. While the second semi final will see the reigning playoff champions, Cardiff, face the Nottingham Panthers who breezed by Fife in their home tie last night. Never before have the Belfast Giants had the opportunity to sweep the board and lift all trophies. 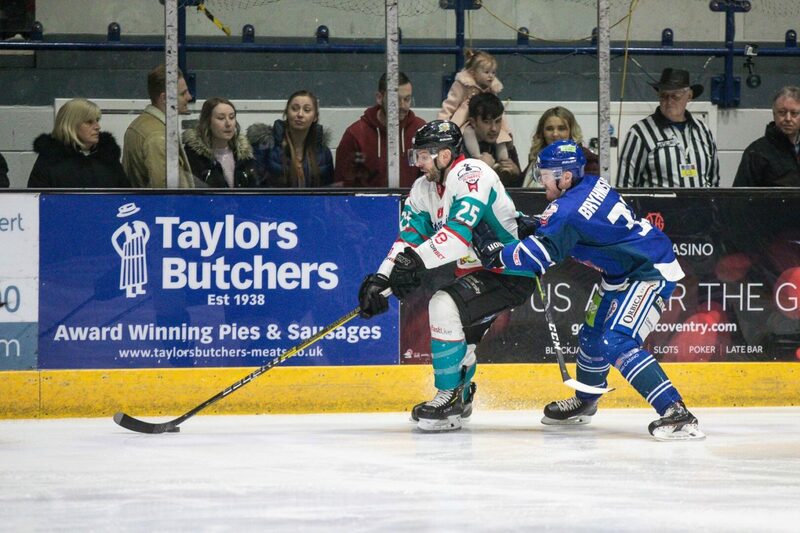 This Giants side with their demolition of the team who beat Cardiff 3-1 only a week previous on the same ice, was a message to the EIHL. Make no mistake. We want that final trophy! PODCAST: Champions – This Week’s A View From The Bridge is a TWO PART Special featuring the Elite League Champions!